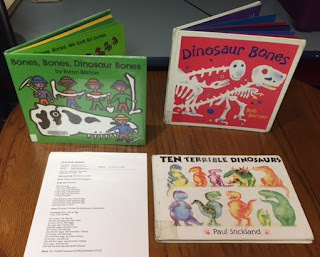 Book: Bones, Bones, Dinosaur Bones by Byron Barton. We talked about dinosaur bones and how scientists find them and put them in museums. I really like this song because it's catchy and easy for kids and parents to learn and it reinforces the knowledge that dinosaurs lived a long time ago and they don't live anymore. It's also good practice for counting. Book: Dinosaur Bones by Bob Barner. We talked about bones and felt some bones in our bodies (the front of your legs and your wrists are great places to demonstrate feeling your bones). Our bones help us move and the dinosaurs' bones helped them move, too. 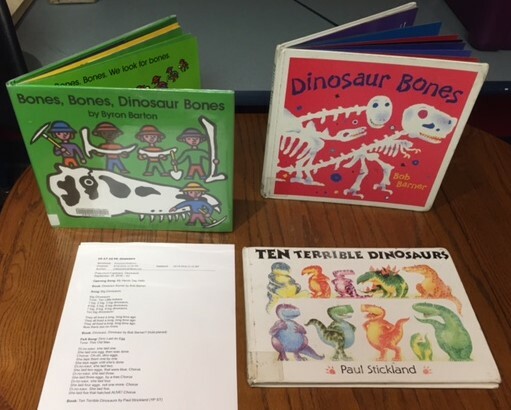 This book has a simple, rhyming text that teaches that dinosaurs were more than just dusty bones in a museum. They actually used their bones, just like we use our bones. Each page has additional info in smaller type that you can read if you have an older or more experienced group. Song: Head, Shoulders, Knees, and Toes. I could tell we needed a little wiggle break and this is my go-to. To stretch it out a little bit, I always ask kids to identify their body parts first: Where is your head? Where are your toes? etc. And then after we do the song, we repeat it fast and SUPERFAST (and you can do it slowly, as well, if you need more movement). She laid one egg, then was done. She lays them one by one. She lays eggs until she’s done. I like this song because it introduces the information that dinosaurs laid eggs that hatched into baby dinosaurs. 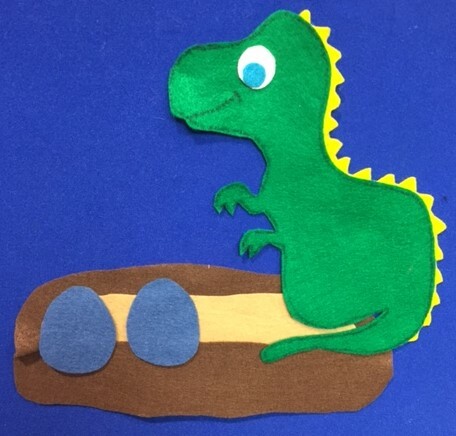 I asked Ms. T to make me a felt set for this story so we had a visual to go with it. Book: Ten Terrible Dinosaurs by Paul Strickland. This one was just a silly story with dinosaurs in it, but it also introduces some great vocabulary ("elated", "weary"). Whenever I come to a word that kids probably don't know, I define it for them if I can do so easily. Reading books with preschoolers is a great way to expose them to new words and knowing lots of words makes it easier to learn to read when it's time. Felt Activity: Dinosaurs. 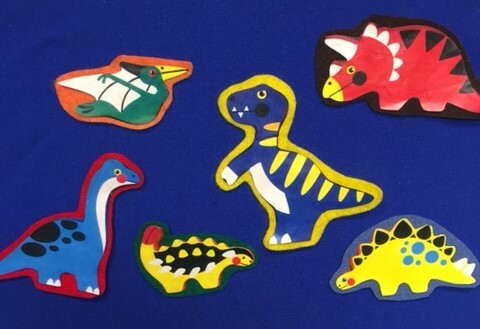 I passed out the felt dinosaurs and asked kids to bring them up and put them on the board when I called the dinosaur they had. 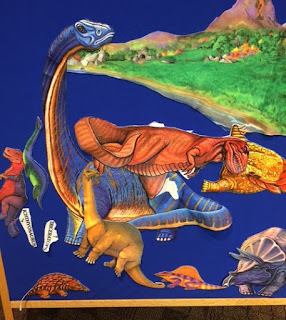 I did use the names for the dinosaurs, but also described them and showed an example, so the kids didn't need to know the names of the dinosaurs, but they were exposed to those words. I got out the blocks (we always use blocks) and our dinosaur toys from our Toddler Time toys. I discovered that we have this really cool felt set of dinosaurs, so I put that out on the felt board. It is so old that I have no idea where it came from, my apologies! 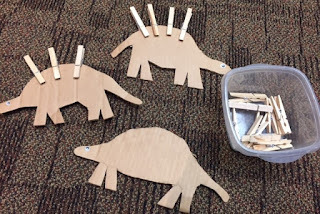 And we practiced fine motor skills with clothespin stegosaurus. This article recently was shared around on Facebook: Losing Our Grip: More Students Entering School Without Fine Motor Skills. Using clothespins in play is a great way to improve hand strength and build fine motor skills. These cardboard dinosaurs are very simple and cheap, but I had a handful of kids working with me quite a bit, putting the clothespins on and taking them off. You can use these for a game using a die to tell how many spikes to put on. Or you can just free play with them like we did.